"Ernie was so comfortable with the students. He got them up on their feet. They were really connecting with a form of music that they don't know they like... and yet so much of the music they listen to has it's roots in the blues. The kids loved the music. They loved Ernie. His music grabbed them." Blues music is a powerful window into our history as Americans. It carries within it the foundation of every major American musical form, including jazz, rhythm and blues, rock and roll, hip-hop, and soul – it truly is the foundation of American popular music. But the blues go far beyond their role in American music. This music offers a lens through which to view the history of America, from the rural music that captures the suffering, anguish and hopes of those enduring so many years as slaves and tenant farmers, through the nation’s urbanization and industrialization, and our struggles with justice and equality in the 19th and 20th centuries. The blues can be a window into this rich and challenging history. 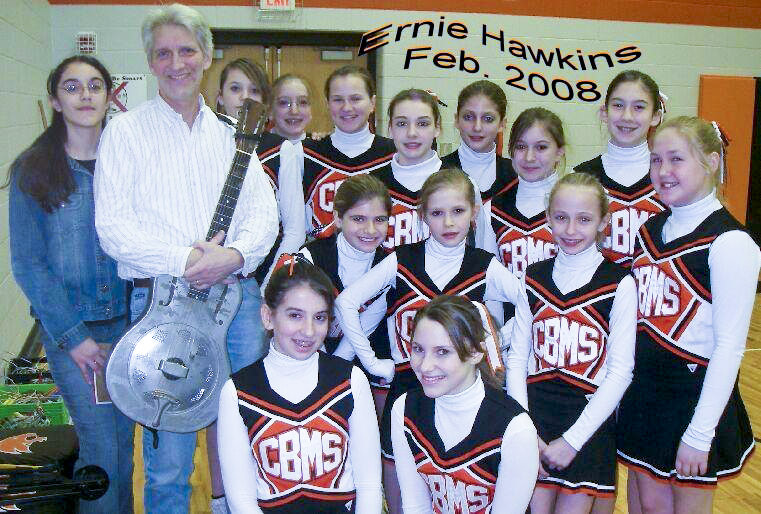 The music of Ernie Hawkins brings to schools the opportunity to experience first hand the artifacts of that history, through music that will appeal to a wide range of student learning styles, allowing academic study to be both rigorous and exciting. Ernie Hawkins represents the best of the blues tradition. He brings a rare opportunity for students to experience the expressions of American history first hand. In his music, we feel the life and breath of those Americans who have gone before, the hard lessons learned, and the challenges we still face. What are the blues? What are the meanings of the blues? II. Time Continuity and Change: Experiences that provide for the study of the ways human beings view themselves in and over time. V. Individuals, Groups and Institutions: Experiences that provide for the study of interactions among individuals, groups and institutions..
VI. Power, Authority and Governance: Experiences that provide for the study of how people create and change structures of power, authority and governance. VII. Production, Distribution and Consumption: Experiences that provide for the study of how people organize the production, distribution, and consumption of goods and services. X. Civic Ideals and Practices: Experiences that provide for the ideals, principles, and practices of citizenship in a democratic republic. 2. Students read a wide range of literature from many periods in many genres to build an understanding of the many dimensions of human experience. 6. Students apply knowledge of language structure, language conventions, media techniques, figurative language, and genre to create, critiques, and discuss print and non-print texts. 8. Students use a variety of technological information resources to gather and synthesize information and to create and communicate knowledge. 9. Students develop an understanding of and respect for diversity in language use, patterns and dialects across cultures, ethnic groups, geographic regions and social roles. II Time Continuity and Change: Experiences that provide for the study of the ways human beings view themselves in and over time. V Individuals, Groups and Institutions: Experiences that provide for the study of interactions among individuals, groups and institutions. 1.Students read a wide range of print and non-print texts to build an understanding of texts, of themselves, and of the cultures of the United States and the world; to acquire new information, to respond to the needs and demands of society and the workplace; and for personal fulfillment. 6.Students apply knowledge of language structure, language conventions, media techniques, figurative language, and genre to create, critiques, and discuss print and non-print texts.